​Because it invisibly handles tough tasks — like monitoring sound quality, suppressing feedback, and optimizing power use -- Pro Digital is as easy on school budgets as it is to use. 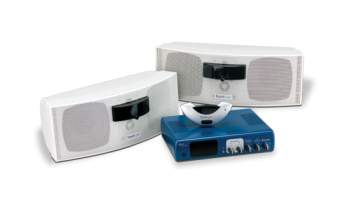 Classroom sound has never been this smart. And now with the IR Speaker unit that combines three speakers with an infrared sensor, installations take about half the time of four speaker systems, freeing installers from hanging each component separately - less time, lower cost.